Some people consider the hobbled Roman shade to be the "classic" Roman shade. It is also known as a waterfall or a cascade Roman shade. 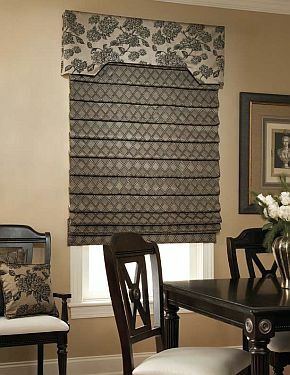 Hobbled Roman shades have excess fabric between each pleat to keep folds in the fabric even when fully extended. The folds remain in place creating a soft ripple effect. The shadows from the folds create a more strongly horizontal effect than front fold shades. The 2" folds also give more dimension to the shade. Fabrics well-suited for hobbled shades are solids, jacquards, vertical stripes, randoms and floral patterns. Less well are regular patterns, toile and large scale patterns. Hobbled shade mounted outside the window casings. 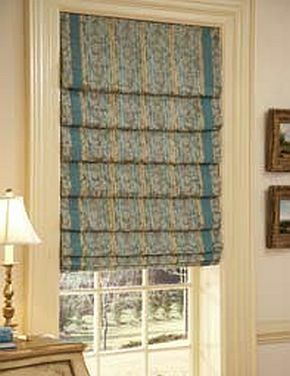 With a regular pattern fabric and a separate cornice board header. Inside mount shade with blackout lining and an attached valance. Velvet type fabric for full folds. Inside mount hobbled shade in a jacquard pattern with a vertical stripe. Coordinating side banding adds a vertical emphasis. Another example of banding on hobbled Roman shades. Here the banding is on the very edge of the shade rather than inset. Standard lining allows filtered illumination.